Shelter Island, found just off the North Fork of Long Island, is a lovely place for a wedding. It combines the feel of an old beach community where everyone is there to help out with many talented event professionals who are used to Long Island weddings. Add in plenty of beautiful venues — everyone loves The Boathouse on Shelter Island! — and you have a recipe for a great wedding celebration. Another thing you have? Plenty of places to take stunning Shelter Island wedding photos! If you visit Shelter Island for your Long Island beach trips but haven’t spent much time there outside of your vacations, you might not be familiar with all the pretty spots that are off the beaten path. That’s where hiring a Long Island wedding photographer comes in handy! Long Island wedding photographers know all the best spots for photos. 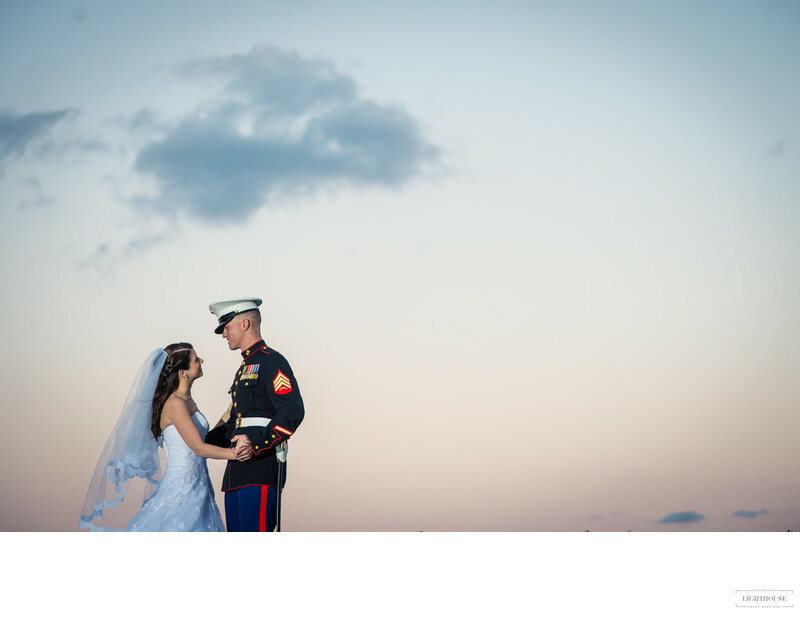 Whether you want portraits of a romantic walk on the beach or photos of your entire wedding party at the marina, a local wedding photographer can help you find the perfect places to take your Shelter Island wedding photos. Shelter Island may be small, but it has plenty of lovely little spots to visit! Below are five of our favorite places for Shelter Island wedding photos. Found at the end of Rocky Point Avenue on the west side of Shelter Island, Kissing Rock got its name before the area was even developed. Back in the early 20th century, Kissing Rock was a favorite rendezvous for couples in love to enjoy the moon and stars. Today, it’s a perfect spot for a romantic portraits of two newlyweds. And there’s even a sweet little lookout gazebo where you can enjoy the view over the water together. Found toward the south end of the Island, Wades Beach is one of the prettiest family beaches here, with beautiful sandy shores, rolling waves, and lovely views over the Peconic River. It’s an especially breathtaking spot at sunset. The parking here is very convenient, but as local wedding photographers know, it does have restrictions! To park at Wades Beach (or Crescent Beach), you’ll need to get to get a beach parking sticker. These permits can be bought at City Hall, and you can get them for either the day or the week. This pretty little village has the odd designation of being the least populated village in New York — but the calm and quiet only make it more perfect for sweet, simple photos. The immaculate green spaces, sweeping trees, and sparkling blue water of the Peconic River make Dering Harbor a lovely place for photos, especially right at Dering Point. If you’ve got a small group for photos, or are hoping to grab a few couples’ portraits, this is a lovely little spot to visit. Crescent Beach, also known as Sunset Beach, is considered one of the most romantic beaches on Shelter Island! Not far from Kissing Point and near many of the popular inns and hotels on the island, it gets its nickname from the spectacular Peconic River sunset views that you can see here. Like Wades Beach, you will need a permit to park here. Or, if your reception is at a nearby venue, we can simply stroll down here in time for a romantic sunset photoshoot! Found almost in the middle of the island, the Historical Society is a beautiful old building with wide verandahs, surrounded by sweeping green lawns and towering old trees. If you want your wedding photos to have a casual, rustic, old fashioned feel — or if you have a real soft spot for the history of Shelter Island — you’ll love a stop here. We do, however, recommend calling ahead to make sure that there are no events happening at the property and confirm that it’s okay for our group to show up for a few photos. Choosing a local wedding photographer, but not sure how to pick the right one for you? We’ve got nine questions to ask your Long Island wedding photographer [link] before you make a decision. Or feel free to get in touch here [link] with any questions you may have!